M Hudson wrote: Where is the chip? looking at a new knife. Stainless or no ? Nick Gangas wrote: looking at a new knife. Stainless or no ? Lots of great Japanese stainless out there, if you are leaning toward ease of care. If you have a set of quality stones and are willing to put in the work, shape it out with a low grit stone, and go up from there in grit to set the edge and polish your scratches out. Nakiri. 165 MM. Chopping veggies. Any difference in quality ? And a full on custom from one of the most respected us makers. Mark linked to the Watanabe santoku, rather than the nakiri. This appears to be the most universally esteemed nakiri at the Kitchen Knife Forum, you can't go wrong based on that. I see this on FB - offering $1295 set of three for $220. I saw that offer as well. And if you google search there are certainly places (Amazon) selling them for $1295, so it seems like a great deal. But I don't know the brand myself. I have only one word to describe my Watanabe santoku, weapon. The nakiri? Exactly the same. dteng wrote: Anybody heard of Kamikoto? I researched that when it showed up as a Facebook sponsored post (which is a bad sign to start with), and it looks like an advertising gimmick to me. There seems to be zero online history about this company, and contrary to Scott, I couldn't find anywhere selling it for more than the price they were offering (although I could certainly have missed something in my Google search). Also, zero information about the knives on their website (metal used, angle, etc.). Their sales pitch is basically "we are a pretty Japanese knife that costs more than your Wusthof, don't ask any questions." Last edited by K_F_o_l_e_y on May 25th, 2017, 9:02 am, edited 1 time in total. Has anyone tried Middleton Made Knives, handmade by Quintin Middleton in Charleston SC? They are certainly gorgeous looking. Robert Pollard-Smith wrote: Mark linked to the Watanabe santoku, rather than the nakiri. This appears to be the most universally esteemed nakiri at the Kitchen Knife Forum, you can't go wrong based on that. K_F_o_l_e_y wrote: Has anyone tried Middleton Made Knives, handmade by Quintin Middleton in Charleston SC? They are certainly gorgeous looking. I dont know a thing about him, but here is what I found over the several years I chased unicorn knives. There are tons of people selling Damascus blanks these days. So getting a beautiful "looking" blade is not all that hard. Getting one which actually cuts well for its intended purpose is quite another thing. Beauty is in the eye of the beholder, but performance is in the hand. We cook a lot at my house, and in fact we hardly ever eat out. We have fun cooking and drinking wine on weekends, and that usually means to me that I get as good, or in some cases better food and wine for much less money, and I don't have to worry about driving for either of us. I just went and counted my remaining J knives and I have 12 left. As I said earlier I have one full on custom that is beautiful. I mean it really is, but cuts like crap no matter who works it up. Yes it cuts, but beside my Wantanable, its laughable and it was around 2500 dollars. This particular maker got in a shipment of blue 1 which he had never worked before and its the steel I like most in my other high end knives so I sucked it up and purchased. More than likely the stupidest thing I have done with regard to an impulse buy. I have 3 Wantanable, the two I linked above and a custom 240 K tip guyuto. I love that knife more than any of my gyutos. I also have 3 from this line and love them as well. I have a 210 petty, a 270 suji and a 240 K Guyuto. Back a few years ago these only came in blue steel so thats what all mine are. Beautiful knives and sharp as razors. You better bring your knife skills to use them or you will damage them in quick order. One wrong twist and cut in a board and you have a chipped or worse blade. I only picked up the 240 because a guy on the knife forums needed cash and sold it for a song. I have a variety of other and even some cheap ones in ux10 a misono I believe. Here is what I know now after using some of them for 3 years. If I had it all to do over again, I would have skipped the crazy custom handles I have on my Wantanables and skipped the other two full on customs. I would also not purchase the Kagekiyos. I would have a 270 honyaki suji by Wantanabe (custom), a 150 Petty by Wantanabe, a 165 Nikiri by Wantanable (all from his pro line) and a 210 Guyuto by Shigefusa, but good luck finding one these days. Oh, and I would throw in a parer by delbert ealy. very pretty knives and easy to afford. Of course, if you ask any knife guy you are going to get another list, but my point is I found I liked my work horse knives way better (day in an day out) than my really expensive knives. One caveat, I find I use the 210 petty more than I would have thought, but I suspect its because I have it. I trim all my steaks and roast and do so veggie work with it where I need the tip. I own several Japanese knife brands, but not familiar with Konosuke. Don't know/ have experience with Konosuke personally other than looking at their stupid expensive stuff. Just bought a Sabatier Nogent 6" petty and a Sabatier Canadian Massif 8.5" chef de chef. Both NOS 90-110 year old blades. Where can someone buy a Wantanabe knife? I went to the web site posted on this thread, but the pricing is in Japanese Yen. Dave, that's the only place. Just google exchange rates. 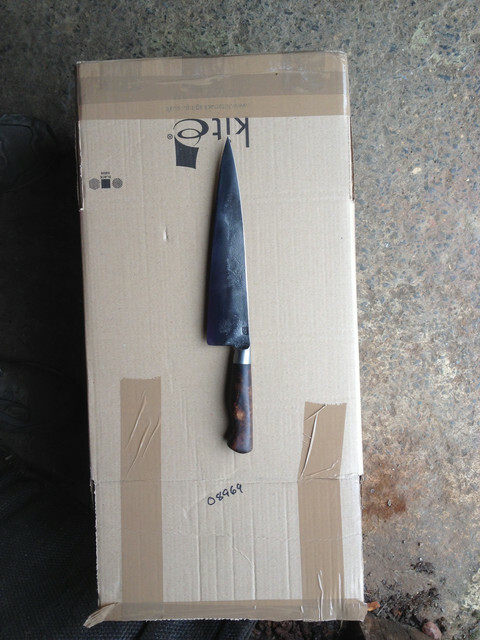 Dave McCloskey wrote: Where can someone buy a Wantanabe knife? I went to the web site posted on this thread, but the pricing is in Japanese Yen. I just bought one based on the recommendation of this group. When you purchase they'll send you an invoice to pay by paypal. They will convert for you. Thanks I've reached out to them about purchasing the Professional Nakkiri knife. Please post your impressions when you receive your knife. I'm sending Shinichi a IMPO tomorrow. I only went with the Nakkiri, to see if I like it before I purchase the Santoku. Last time I was in Tokyo I purchased a Nakiri from Fujiwara Teruyasu (http://www.teruyasu.net/products/detail_15.html). It's a carbon steel core with stainless outer layers, so you get the best of both worlds. Next time I'm back I'm picking up a Gyuto from them. They are not cheap but the edge is amazing. Very interesting thread. Currently I have a mix of Shun/Miyabi/Global knives but I am interested in getting some better steel in my kitchen. I think I may reach out to the Watanabe as well about that Nakkiri. Also, any tips on whetstone sharpening? I got the Shun stone from Sur la Table and have managed to blemish the damascus on one of my knives. I am assuming I had the knife at too shallow of an angle. Should I practice on non-damascus knives and move on from there once I get comfortable? I hate relying on shops to do all my sharpening. I have a 210 petty, a 270 suji and a 240 K Guyuto. Humor me here and pretend I'm a village idiot - for those that know me, they realize this is not a stretch. But, on the above knives and in conjunction with Mark's other sentence about "bringing your knife skills" - can he or others educate me on the above knives with respect to what their function/purpose is and how would one know if they do or do not have decent 'skills'? For more precision - I guess I'm looking for a sentence like "Sure, idiot, the 210 is used as though it would be a paring knife needing control and the 270 is a finished product slicing knife whereas the 240 is kind of an all-purpose tool you can do prep with and break down portions and veggies alike." Seems very staged to me. Truth is these are all just nice to have. Of the three you listed I use the 210 petty the most for detail work and steak / roast trimming. Last week I took delivery of the Watanabe Nakiri. I can see why so many folks like them. The length is perfect and the handle fits in my hand like a glove. I have sharper edges in my collection, but not by much. It's holding an edge very well. Great knife, really enjoying it. Dan Prendergast a smith out of the UK just made this for me. 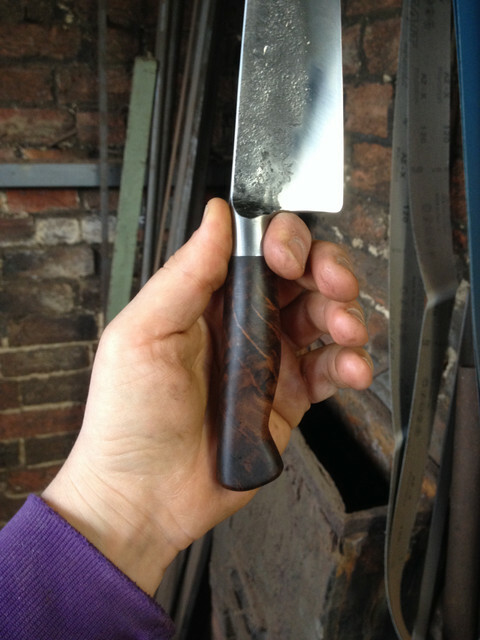 230mm, 1.2519 WCrV Steel (similar to 52100), Walnut Burl handle. Does anyone have any tips on getting the choil of your German knives eased or rounded? I've got some classic Wustof that I take when I cook away from home but sometimes that means hours of prep work and I'd like to have something more comfortable without bringing my Japanese knives. I sharpened my Shun's last night and they feel much better. My chefs knife has a couple small scratches above the edge that I was wondering if anyone knows how I could polish them out. P. Willenberg wrote: Does anyone have any tips on getting the choil of your German knives eased or rounded? Paul, just take them to any sharpener tha has a belt grinder, they can take off the bottom quarter inch of the bolster. I shop often at the Knifewear store here in Vancouver. Their Knifewear brand stones are a step above any I have seen. The 220 works great for chips and reworking edges. I also use the 1000 and 4000. Is this worth $360 after discount for 9 inch chef knife? Finally completed my little collection. These knives are easy to work with and sharpen (Korin, thank you for your videos). Also they are not too expensive. Pretty popular with restaurants for that reason. +1 on JKI, solid rec. Thx, I bought from JKI before and was thinking of branching out. But I'll send them a note. I have bought from Watanabe before. Always a pleasure to deal with. I checked his web site and he posted on 9/28 that he has custom order that will keep him busy until 2019. He says he stopped which I guess means no contact. Just a followup I did get in touch with Shinichi at Watanabe. It just took many tries but once engaged it was all very helpful and quick. I purchased the tools/weapons of choice. Thx.